On the Actions menu there is an entry Import XML which enables you to import formatted content from other publishing systems, such as Adobe InDesign or WordPress. arms with sharp claws, and a turtle-like beak. of the University of Maryland in College Park. Multiple <article> tags can be enclosed by the top-level <articles> tag, so that you can import a large number of articles from a single XML file. Once you have an appropriately formatted XML file exported from the other system, use the Import XML page to upload it. You will need to set the Article Type, Language and Publication that you wish to import into, and also if you wish to Overwrite existing articles with the same names. Setting an Issue and Section to import into is optional. 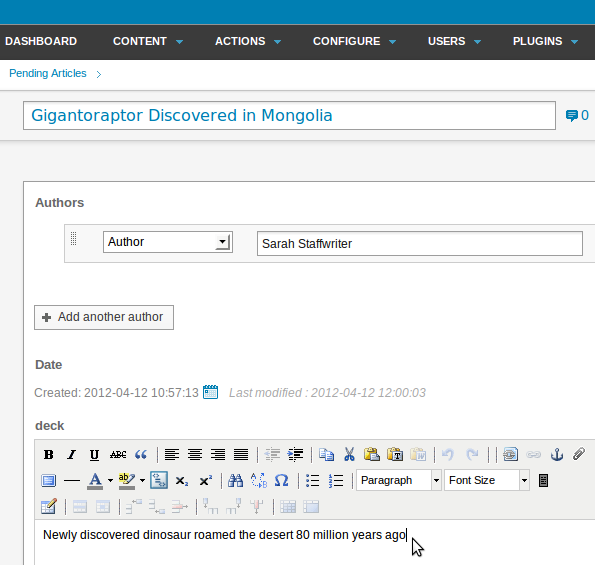 The newly imported articles will be listed in the Pending widget on the Dashboard, as well as the Pending articles page on the Content menu. In either of these lists, you can click on the article Title to edit the article. 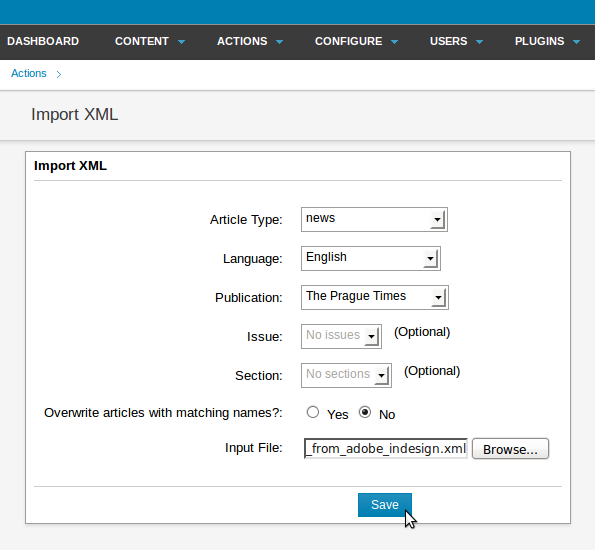 If there is a mismatch between the tags in the XML file you have tried to import, and the fields in the Article Type that you have attempted to import into, Newscoop will list the empty fields and the problematic tags. You can then re-export the XML file from the other application with the correct tags. Should the XML file be incorrectly formatted altogether, Newscoop will refuse to import it.